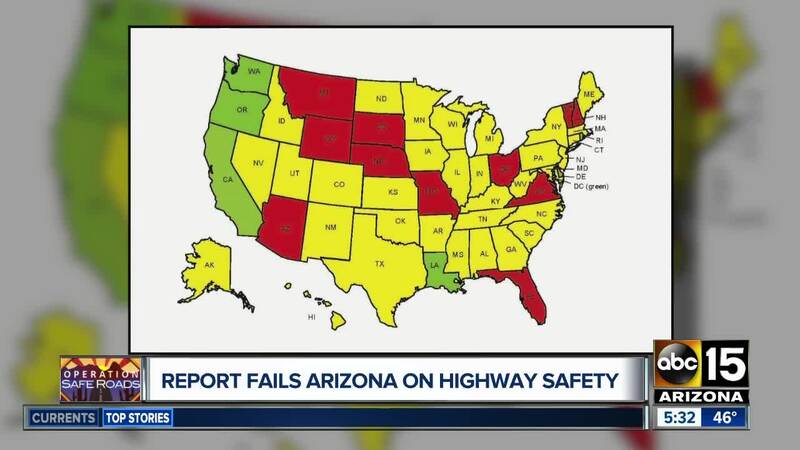 Arizona is one of 11 states who received a Red rating in the 2019 Roadmap of State Highway Safety Laws report, meaning we “fall dangerously behind in adoption of Advocates’ recommended optimal laws”. PHOENIX — A report released by the Advocates for Highway and Auto Safety suggests that Arizona is falling behind with laws for driver and passenger safety. Only six states received a Green rating, showing significant advancement in adopting recommended laws. Arizona had 8,631 crash fatalities in the last 10 years, including 1,000 in 2017 alone, the study shows. Our state has an annual economic cost due to vehicle crashes of $4.183 billion, they report. The 57-page study also looked at the total number of crashes in all states, the number of crashes involving distracted or impaired drivers, motorcyclists, unrestrained passengers and more. It also has a section on concerns about driverless vehicles. See the full report here .